A simple rotatable locking mechanism used with ring systems that open like the rings of a three-ring binder. A ring system has rings each having two ring halves and hinged leaves connected to each other and attached to each ring half respectively. The locking mechanism on the ring system presses against the leaves to prevent the ring halves from opening. A lock for the rings can comprise an Allen screw or a similar rotatable device located at the cover over the hinged leaves of a binder or a flip chart holder. Ideally, the device has a lip or similar raised area so it is not removable from an aperture in the cover of a binder or a lockable flip chart holder. Locking the rings provides security so users cannot take pages out of a binder or a flip chart holder. We would be interesting in selling or licensing the patent and its related patent 6,666,609 that covers a flip chart holder. The market potential is huge for three-ring binders or flip chart holders where the owner does not want content to be removed from the ring system without the key (as simple as an Allen screw used with a wrench with an aperture in a standard ring system). It could be used for public displays at point-of-sale ranging to confidential/classified materials kept in binders where removal of pages is not desired. The exclusive rights have been used on a limited run of flip chart holders used as POP information sources. Do you have a need for a lockable ring mechanism that enables both easy content updates for ring binders and P.O.P flip chart displays and prevents the unauthorized removal of pages? While other approaches could solve the problems that this device is designed to overcome, none does so as proficiently or as cost effectively as the patented technology. 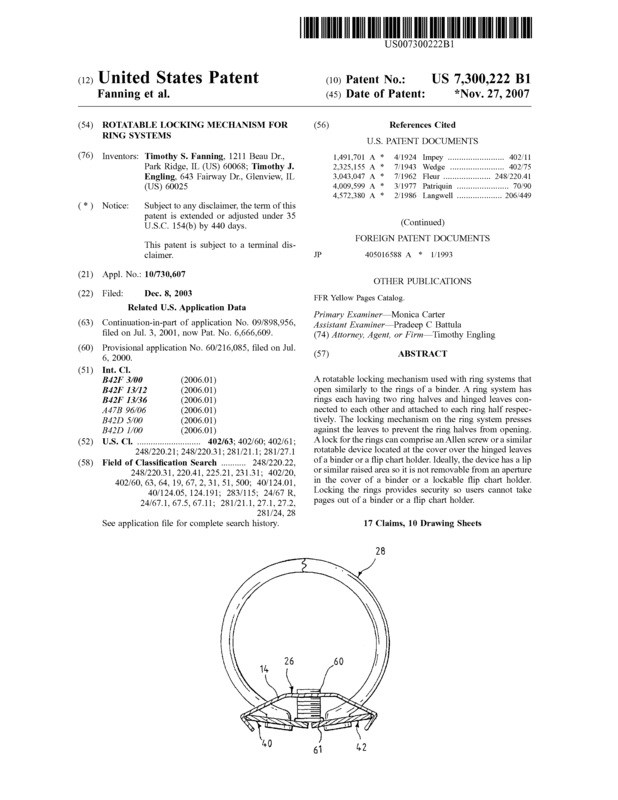 Page created at 2019-04-21 16:28:25, Patent Auction Time.